The world relies on registered nurses. There are more than 3.9 million RNs in the U.S. alone — the largest segment of health care staff, according to a World Health Statistics Report. The need for qualified RNs isn’t slowing down: The American Nurses Association reported that there will be more registered nurse jobs available through 2022 than any other profession in the U.S., to the tune of 1.1 million new jobs, according to the Bureau of Labor Statistics. And here’s the problem: For all their importance, a serious nursing shortage is perhaps underscored by a more dire need for nurse educators — the seasoned clinicians and academic pros who usher students from the classroom into the workforce. Without nurse educators, the path for potential students is blocked before entering a classroom. Research from the American Association of Colleges of Nursing found that 56,000 of undergraduate nursing applicants were turned away in 2017 despite their qualifications, further echoing the call for teaching faculty. The same deficiencies are felt in Washington state’s education system. “It’s a really big need, actually,” says Sofia Aragon, JD, BSN, RN, executive director of the Washington Center for Nursing and president of the National Forum of Nursing Workforce Centers. “We have information that nurse educators are older than the general nursing population, so many of them may be retiring soon. Indeed, 23 percent of Washington state’s nurse educators retired in 2012 and are continuing to leave the workforce. This statistic combined with declining enrollment in nursing master’s programs presents a question for Washington’s health care system and state legislature: What will inspire would-be educators to take the next step? Conducting academic and clinical research. Collaborating with fellow faculty members to improve the quality of nursing education. Joining and participating in professional organizations. Continuing clinical practice in tandem with teaching responsibilities. 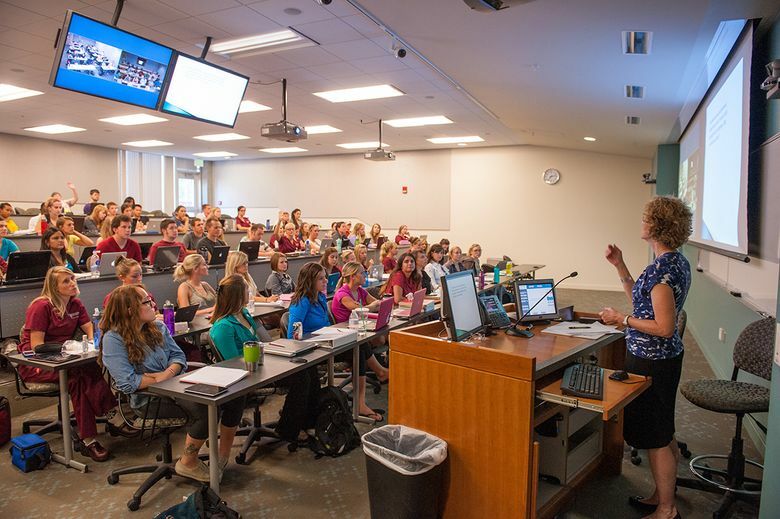 Enjoying the classroom setting is undoubtedly essential for nursing educators, beginning with their own educations. The average instructor has years of clinical experience behind them, but there are a few academic avenues that can lead to a teaching career. Bachelor’s of Science in Nursing: BSNs are qualified to teach Licensed Practical Nurses in two- and three-year degree programs. Master’s of Science in Nursing: Instructors teaching at the baccalaureate level must hold a master’s degree in nursing to qualify. Ph.D. or Doctor of Nursing Practice: Nurses who hold doctorate degrees are highly sought after for their extensive knowledge, desire to perform clinical research and redefine nursing curriculum. Visit the Washington State Department of Health for a complete list of institutions where you can earn a nursing degree. Personal desire aside, the financial challenges of becoming a nurse educator are apparent to Aragon and the WCN. “It’s a quite a cost to pursue [a degree], and for nurses who are going into it with considerable debt, which is not uncommon, that might be a difficult decision to make,” she says. It’s difficult to pinpoint an “average” salary for educators, because of the variability in contract lengths and other terms. However, according to a recent survey from Nurse.com, salary is the most important factor for nurses when seeking employment. Recently, the WCN also spearheaded Action Now! – an initiative that includes the statewide central nursing resource center, the Washington State Nursing Care Quality Assurance Commission, the state’s nursing regulatory board, the Council on Nursing Education in Washington State, and the statewide organization of deans and directors of Washington’s nursing programs. The goal of Action Now! is to help stakeholders address and provide opportunities for nurses to advance their education and establish sustainable financing for nursing programs. The Washington Center for Nursing supports a healthier Washington by building a diverse, highly qualified nursing workforce. For more information, contact Action Now! co-leads Sofia Aragon, Sarah Bear and Mindy Schaffner: ActionNow@wcnursing.org.